Life evolves by consciousness, consciousness evolves by organization. Human life evolves by a progressive heightening of our awareness, expansion of our knowledge, widening of our attitudes, and elevation of our values. This evolving human consciousness progressively expresses itself through the formulation and creation of more complex and effective organization – a seamlessly integrated, organic web of relationships encompassing ideas, knowledge, people, activities, processes, systems, technology, laws, institutions, power and values – political, economic, social, cultural, intellectual and psychological. The capacities of one person acting on his own are limited, but the action of organization has no limit. Organization creates abundance. The evolution of economy is an integral part of the wider evolution of human consciousness and social organization. The history of economics and economic thought reflect this process. Progressive advances in our collective capacity to generate wealth and promote human security are the results of this process. Our comprehension of the process has a profound bearing on the development of that capacity. Rightly perceived, we can discover the true relationship between scarcity and wealth, uncertainty and human security, and the means to transform one into the other. This requires a change in perspective, a shift in values from the quest for immutable, natural economic laws governing the blind pursuit of money and monetarized growth to a focus on the intrinsic value and creative potential of human beings in quest of ever-expanding security, welfare and well-being – the real wealth – that all humanity aspires for. It requires, too, the development of appropriate measures consistent with this shift in values and perspective. When growth focuses on people rather than things, the limits to growth give way to limitless growth. Economics as a social discipline was founded at the end of the eighteenth century on the basis of Adam Smith’s Wealth of Nations. Writing at the dawn of the Industrial Revolution when agriculture was still perceived as the major determinant of wealth, Smith was a practicing moral philosopher, firmly committed to fighting poverty and generating prosperity, not only in his native Scotland but worldwide. He perceived the enormous power of social organization to generate wealth – the power of division, specialization of labor and technology to optimize efficiency and the power of markets and trade, both domestic and international, to incentivize producers and benefit consumers. A firm believer in freedom, he advocated free trade as more conducive to human welfare than mercantilist and monopolistic policies; but he would never have countenanced a world in which the sanctity of the market is given precedence over the well-being of human beings. He believed in freeing economic activity from the arbitrary will of feudal landlords, monarchs and parliaments, but equally so from the narrow self-interest of businesses which advocated policies beneficial to themselves while detrimental to society-at-large. Born in an age steeped in Newtonian and Cartesian concepts of immutable natural laws and the clockwork certainty of physical nature, he based his concept of economic value on the equilibrium price between supply and demand resulting from unimpeded exchange of goods. That, he argued, was the best way to provide signals to producers where to invest their capital and what to produce and to ensure the lowest possible price to the consumer. Considering foreign wars and enforced colonization a tremendous waste of capital and human resources, which should be more properly invested for productive purposes, he would have firmly rejected the contemporary view that all economic growth is good growth. Yet theoretically he did not distinguish positive from negative contributions to national wealth. At a time when less than half of all economic activity occurred through monetary transactions, he perceived the catalytic role that money played in facilitating commercial exchange and promoting capital investment in manufacturing. But he was extremely skeptical of the efficacy of separating ownership from management and would have been appalled by modern financial markets which have divorced money from its primary role as a lubricant to production and trade in the real economy. An astute observer of fact with a keen historical perspective of social evolution, he drew lessons from the distant past applicable to the tumultuous times in which he lived and based his conclusions on experience rather than ideology. His contributions in thought were validated by the remarkable achievements of the Industrial Revolution, but most of what we now refer to as the service sector did not exist at the time and lay outside his field of consideration. The world has radically changed since Smith’s days, but economics has remained strangely wedded to concepts which were brilliant insights in his time, but irrelevant, misplaced and even dangerous in our own. Smith would have been the first to acknowledge it. Early in the 20th century, the focus of economics shifted from the supply to the demand side of the trade equation, but the equation itself and the basis for valuing economic activity remained unquestioned. The reference to a price equilibrium justified the search for a system providing a higher and higher degree of certainty. It was deterministic, linked to a frozen definition in time and space. Uncertainty was thought to result from insufficient knowledge, a deficiency that could be overcome with time and eventually eliminated. While economics clings to the static concepts of equilibrium and certainty, science has evolved over the past century towards an undeterministic view. It does not pretend to provide definitive (godlike) knowledge. Paradoxically, the more we know, the more we identify an increasing number of questions: understanding our ignorance is the first tool in the advancement of knowledge. We now perceive that certainty is a rare exception rather than the rule. Rather than regarding that as a negative, we perceive that this uncertainty really represents an unlimited field of possibilities out of which we can seek to create positive value, as the insurance industry harnesses the uncertainty of individual events to create greater security for society as a whole. A mechanistic view of manufacturing will not serve in this age in which production volumes are enormous, time quite literally flies, needs change with lightning speed and all aspects of society – and increasingly of the whole world – have become integrated into a unified system, a living organism, that is undergoing a continuous process of rapid evolution. The formulas of economics no longer suffice to reflect the inherent complexity and uncertainty of contemporary society. Our concept of economic time needs to change radically. In a traditional economy, time could be measured from the point at which production begins and ends with a sales transaction. In our contemporary real economy, time begins long before production or sale and extends long afterwards. Research commences years or even decades before a product is ready for market and fails to generate a marketable product more often than it succeeds. The uncertainty of that investment in research constitutes a major portion of the cost of products today. Furthermore, we can no longer assess the cost and profit of a product or service at the precise time of delivery. The costs associated with product recalls, product liability, waste management and remediation may arise years after the sale. The delivery of many services extends over very long periods, as in the case of education, medical care and insurance, and cannot be valued in terms of discrete instantaneous transactions. Value resides in the sustained performance of a complex delivery system over time. Thus, the notion that economic value is created and can be measured at a finite point in time based on cost of production is outdated and needs to be replaced with a concept that takes into account the utilization value and utilization time with reference to the user. When utilization over time is taken into account, we rapidly discover that any hope to arrive at objective certainty (as in classical economic equilibrium) is unrealistic. Uncertainties and probabilities have become essential concepts for understanding and managing the wealth of nations. The key economic challenge today is to understand and manage risks, uncertainty and vulnerability. As Smith understood the negative, wasteful contribution of military expenditure to national wealth, we now realize that this is only one instance of a much broader range of negative economic activities, negative in the sense that they destroy and deplete rather than augment wealth, welfare and well-being. When properly accounted for, depletion of non-renewable resources and pollution of the environment may wholly negate the beneficial effects of economic activities we once cherished with religious faith. The concept of sustainable development is based on the best use and preservation of resources, both human and material, taking into due account the notions of utilization in time and the issue of uncertainty. We need to redefine what we mean by and how we measure value as the basic reference point for the wealth and welfare of nations. Extended monetarization of the economy was an essential component and consequence of the Industrial Revolution and the model of economic growth that has become prevalent worldwide. In recent times, it has been a common error to blithely assume that all growth contributes to human welfare. On the one hand, our per capita economic measures fail to take into account the dramatic increase in income and wealth inequality, concealing the fact that growth and rising national per capita can be associated with flat or falling living standards for large sections of the population. The numbers may indicate overall progress which reality does not reflect. The financial sector which caters disproportionately to the wealthy has been the fastest growing sector in recent decades. But do rising stock prices that boost the balance sheets of the super-rich really reflect a better life for the common man? On the other hand, monetary measures fail to reflect enormous improvements in quality of life as well as the extension of the monetary economy into activities that were previously carried out without monetary transactions. The changes represented by uncertainty, utilization time, negative value and monetarization in economics represent quantum shifts in conception comparable in their significance to those brought about in physics by Einstein’s Theory of Relativity and Heisenberg’s Uncertainty principle. They compel us to re-examine economic thought at its very roots, to challenge once sacred beliefs and to fashion new economic theory and new measures appropriate to the economic conditions and social aspirations of humanity in the 21st Century. When we do this, we may not arrive at greater certainty, but we most definitely do arrive at a greater awareness of the creative process and the enormous untapped potential, which are the other side of uncertainty and constitute a fundamental paradox of our existence. For, uncertainty begins to reveal itself as a field of infinite creative possibilities for the generation of wealth and the enhancement of human security. Our conception of heaven is a world blessed with an unlimited and assured abundance of everything good. According to the Bible, Adam and Eve were expelled from the Garden of Eden and cast into a new economic world characterized by scarcity and uncertainty. They discovered a world on which Nature had bestowed a richly abundant physical and biological dowry and patrimony (D&P) of fresh air, pure water, minerals, fruit and nut-laden trees, edible and medicinal plants, animals for food and clothing, and many other riches, though not everywhere and not always in the desired quantity or quality. [*] Their descendants established human settlements on lakes and river basins where basic human needs could be most easily met by hunting and gathering. But as population expanded, Earth’s abundance proved less adequate and reliable. After carefully observing the methods of Nature for millennium, the descendants of Adam and Eve acquired knowledge of some of her methods and even discovered ways to improve upon them. The birth of agriculture marked the first economic revolution in which human beings enhanced the natural productivity of their environment. They replaced the limitations and uncertainty of gathering Nature’s bounty with the greater abundance and security of producing their own food. Wandering tribes gave place to sedentary settlements organized around the seasonal food production cycle. To the natural and biological D&P with which the earth was endowed, human beings added to enhance their well-being a man-made cultural D&P. New facts were discovered, ideas conceived, tools fashioned, methods invented, skills developed, activities sub-divided and specialized, customs and social structures established. Thus, early humanity embarked on the path of development from ignorance to knowledge of Nature’s ways, from unstructured life in nature to the structured life of civilization, from the insecurity of dependence to the greater certainty of mastery. The last ten millennia trace the most recent and dramatic steps in the process by which human beings acquired the knowledge to improve life on earth in quest of heavenly abundance and organized the activities of the society to translate that knowledge into practice. Through never-ending research and experimentation, they discovered new sources of energy as substitutes for wood, new varieties of food, new materials for building and crafting, new instruments and techniques with which to feed, clothe, house, hunt and war with one another. They subdivided the activities of the community into an increasing number of specialized tasks and occupations. They evolved an hierarchy of authority to ensure order, coordination and cooperation among their members. They created customs, rules, laws, systems to protect, standardize, regularize and harmonize. Each of these discoveries and inventions enhanced their capacity for survival amidst the unpredictable conditions imposed by nature. Perhaps to their puzzlement, successive generations of our ancestors discovered that each marvellous achievement was eventually followed by new types of problems and new forms of uncertainty. Leaving the forest for the security of sedentary settlements, as their numbers grew so did their needs, creating new problems associated with larger, more complex societies. The human population grew from about 10 million in 8000 BC to a billion in 1800 AD, when Thomas Malthus forecast that that there would be insufficient resources to feed Europe’s growing population. His calculations were not wrong. As in the case of so many before and after him, his reasonable prediction was confounded by the unexpected. In this case it was the introduction of the potato from the New World. Scarcity and uncertainty were once again forestalled, but not eliminated, by new discovery emerging from the unknown. In 1776 another keen observer and analyst, Adam Smith, published his famous treatise presenting theories that would become the foundation for economics as a specific discipline or science. At a time when French Physiocrats such as Francois Quesnay were insisting that agriculture is the principal source of national wealth, Smith had the foresight to perceive that the development of manufacturing would become a crucial weapon in the fight against scarcity.1 Published a year after James Watt patented his improved steam engine, which was soon to usher in the first Industrial Revolution, Smith perceived a wider formula for national wealth consisting of three major terms: division of labor, accumulation of capital and free markets. A new organization of work employing skilled workers and technology to perform specialized tasks manufacturing more products with less resources and at far lower cost than ever before was the basis.2 Watt’s steam engine provided the energy needed to propel a wide range of machinery and the mechanical impulse to produce the required movements.3 Smith also understood the importance of another form of D&P, monetarized D&P or Capital, as a unique social organization designed to increase the mobility of resources in time and space. Another social organization, Market, provided the maximum incentive to both agricultural and industrial producers to generate saleable surpluses rather than merely produce for self-consumption. At a time when only a tiny portion of produce entered the monetarized sector of the economy, Smith understood the increasingly important role of money and credit to promote trade. But Smith’s conception did not end here. He was a political economist in the classical sense of the word, a branch of moral philosophy concerned with ethics and social justice. He viewed political economy as the science of a statesman or legislator whose twin objectives were to generate prosperity for the people, while also supplying the state with sufficient revenue for public services. His quest was not to discover the immutable natural laws of economics, for he understood that economy was a purely human invention. His goal was to comprehend the most effective policies to optimize the welfare of the people, the nation and the entire global community. His view encompassed economics, politics, public administration, history, anthropology, technology, management, sociology and psychology as interdependent determinants of social accomplishment. Smith was a pragmatic advocate of free markets based on objective evidence, but he was never doctrinaire. His objective was always the welfare of the entire collective, not a belief in social Darwinism. Resigning himself to the inevitable necessity and inherent inefficiency of public administration, he praised Britain for its good governance in comparison with the other nations of Europe. His book is a remarkable record of the endless experimentation by society to arrive at the optimal blend of individual freedom and public policy. Understanding the powerful influence of business on government, he sought a mechanism to minimize this distorting influence. Smith wrote at the dawn of the most remarkable period in human history and foresaw the gathering of social powers which were shaping the future. He perceived how the proper combination of various forms of social capital (cultural D&P) could draw upon the physical and biological endowments of earth to generate unprecedented wealth for the nations of the world. Taken together, they formed the basis for a new social organization of production and consumption with far greater capacity to meet human needs and enhance human welfare. The technological advances of the First Industrial Revolution were primarily quantitative rather than qualitative. The tools and machines employed were extremely simple by contemporary standards and required relatively little education to build or operate. The early steam engines resembled and were based on the same principle as the common kitchen pressure-cooker. The flying weaver-shuttle involved a simple hammer mechanism to propel the shuttle to the other side of the loom. But in the latter half of the 19th century, the development of more sophisticated steam-powered ships and trains followed by the internal combustion engine and electrical power generation ushered in a qualitatively very different Second Industrial Revolution. The D&P for this new phase was human and social capital based on mental resourcefulness applied in the fields of scientific research, commercial organization and finance. Scientific developments were converted into a plethora of new products based on new industrial technologies managed by new types of publically owned and financed, multidivisional business corporations. The increasing emphasis on knowledge also created increasing demand for rapid development of human capital through expansion of the educational system to produce the increasingly diverse range of scientists, engineers, managers, technicians, marketing and investment experts needed by the new social organization. 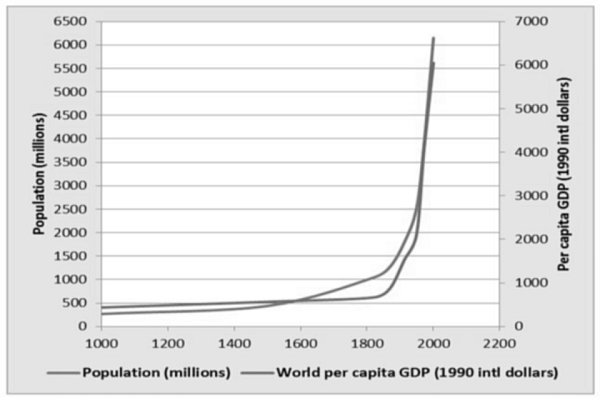 The increasing welfare and human security generated by the two industrial revolutions account for the most rapid expansion in population and living standards the world has ever witnessed, as shown in Figure 1 below. This marriage of science, technology, organization and finance reached full maturity after World War II and was primarily responsible for the 25 years of continuously high rates of growth in most industrialized and industrializing countries. The monetarization of the economy was an essential characteristic of the Industrial Revolution. Money of various types and forms has existed for thousands of years – shells, animals, corn, tobacco, copper, gold and silver were widely used in different times and places. However, until the beginning of the Industrial Revolution only a small part of economic activities involved the exchange of money. Money is one of the greatest of all human inventions. As language radically increases the capacity of human beings to communicate and interrelate, money acts as a catalytic medium to facilitate economic exchange. Its basis is some form of inherently valuable or symbolic object – wampum beads, coins, a deposit receipt for gold or some other commodity, bank notes, bills of exchange, credit cards, digital entries on a computer screen, or something even more ethereal and esoteric. But regardless of its form, the value of money arises from its general social acceptance and public confidence in the social organizations designed to issue, accept, store and regulate it. Its power is based on a system of standardized values by which all products and services can be measured on a common scale. Thus, the transition to a monetarized economy marks a major landmark in the evolution of complex social organization. The spread of money extends the reach of the social structure to encompass domains of life that previously lay beyond the organized sector. In an agrarian society the vast bulk of production and consumption is for self-consumption and does not involve money. Agriculture thrives under conditions in which surplus production can be exchanged for other types of goods, otherwise there is little incentive for a farmer to produce more than a family can consume. Thus surplus gives rise to trade. Trade becomes organized in the form of markets, recurring physical locations or systems for the exchange of goods. Barter trade is limited by the difficulty for both buyers and sellers to find others who have something of equal value that they are willing to exchange – which depends on a double coincidence. Thus, trade gives rise to money, a medium for valuation of all products according to a common scale, which facilitates exchange over vast distances and permits storage of value over long periods of time. Trade in Renaissance Europe flourished after the adoption of Hindu Arabic numerals in the 10th century and double-entry bookkeeping in the 13th century made it far easier to calculate volumes and determine the profitability of transactions. Bills of exchange for goods traded across the continent became an important form of commercial credit, giving rise to the forerunners of modern banks. Thus, accurately minted coins established international markets, accurate accounting methods, commercial credit institutions operating on a foundation of legal rights and judicial safeguards constituting the basis for the rise of the monetarized economy. Until the Industrial Revolution, the use of money was primarily confined to trading activities. No more than one percent of the life of an average European was organized in a monetarized system by selling their time for money or using money for trading; whereas today the average has been estimated at 16 percent or more. [†] During the feudal period, even large feudal landlords possessing thousands of acres of arable land frequently had little use for money, for there was little they could purchase in exchange for their crops. They commonly used their surplus production to feed large numbers of unproductive retainers, often a thousand or more, who endowed the lord with social status in times of peace and an army for defense or conquest in times of war. Thus, even kings and aristocrats often possessed little money, since land was the true measure of wealth. The fact that before 1800 banking activities were often carried on by marginal groups which did not really belong to the upper classes shows that money was still regarded as a secondary tool of societal organization, rather than an integral part of the social structure. Historian Will Durant recounts an incident just before the French Revolution when the very wealthy wife of a leading Parisian banker was invited to an aristocrat’s home for a gathering of high society women. When time came to sit down for dinner, the banker’s wife was asked to eat in the kitchen. After the Revolution broke down the insurmountable barriers between birth and wealth in France, money came into its own as a premier symbol of status and a source of social power. Across the English Channel, the more pragmatic English were making an evolutionary accommodation with money. The younger sons of English aristocrats were permitted to seek their fortunes in business while many an insolvent but titled elder son condescended to marry a woman of wealth from the middle class in order to replenish the economic resources of an impoverished estate and tarnished coat of arms. The growth of commerce and industry had its own revolutionary effect on societal structure and power, gradually undermining the foundations of feudalism in Europe. As improvements in the rural transportation system opened up access to domestic and international markets, wealthy landlords preferred to convert farm surpluses into money to purchase Asian silk, spices and tea or American sugar, rum and tobacco. As a consequence, the population living on huge estates declined from several thousand to a few dozen. Displaced workers migrated to towns and cities in search of productive employment, foregoing the security of dependence and subordination to a wealthy master in return for the freedom to sell their labor or start their own enterprise. Those that remained on the farm gradually acquired more permanent and protected tenant rights and liberties from arbitrary authority. In both instances, a greater freedom of choice and a greater spirit of independence prevailed. Thus, monetarized trade had a powerful transformative effect on society as a whole. Commercial revolution and political revolution proceeded hand in hand. Until Smith’s day, little recognition had been given to the role of money as a means of stimulating production. Money-lending for interest was condemned by the Catholic Church largely because it was not associated with any productive function and was equated with usury. Saving was regarded as a socially unproductive and socially reprehensible activity, which was often mocked in the classical literature as in Moliere’s play The Miser. Before the Industrial Revolution all debts were considered ‘bad’ and failure to pay one’s debts was sufficient grounds for imprisonment, as depicted in Oliver Goldsmith’s novel The Vicar of Wakefield. When Goldsmith was himself thrown in debtor’s prison, his friend Dr. Samuel Johnson discovered this manuscript at Goldsmith’s home and sold it to raise sufficient funds to release him from jail. Smith challenged the moralistic attitudes of previous centuries, extolling the virtue of savings as the principal source of the capital required for investment to enhance the wealth and welfare of nations. The growth of trade stimulated demand for money and the need for capital accumulation. Improved rural transport opened up distant markets for agricultural surpluses, necessitating the shift from barter to a more efficient medium of exchange. Long distance sea trade in luxury goods generated increasing demand for gold and silver coinage. Until 1800 banks mainly engaged in providing commercial credit for trading activities in which investment rarely exceeded five percent of total sales. But the high cost of tools and machinery required for industrialization, which demanded increasing amounts of capital, gradually transformed banking into a highly effective social organization for collecting public savings and channeling it for productive investment in industry. Joint stock companies or corporations in which several investors shared ownership became more prevalent. The development of new moral values and cultural attitudes paralleled the emergence of new technologies and production processes. These changes also brought about a marked change in social values and social power. As industry became an increasingly important source of national wealth and military power, the power and status of the aristocracy and the church gave way to the power and status of money. The monetarization of the economy led to the monetarization of society and politics. The Industrial Revolution became a revolution of capitalism. Originally a symbol of economic value and purchasing power, through this process money became increasingly a symbol of social value and social power. Sacs of gold coins sufficient to purchase a rural estate or a shipload of merchandise gradually acquired the power for entry into the social elite and the halls of political power. Money conquered space, making products mobile. It became a catalyst for economic transactions. So too it abridged or eradicated social distance between the classes. It conquered time by enabling a family to acquire in a single life time the status and power once proudly accumulated by inheritance over countless generations. Money not only made products more mobile. It made social and political power more mobile and transferable. It made possible the alteration of social structures without guillotining an entire class of people, thereby facilitating peaceful social evolution in place of violent political revolution. A society capable of more rapid change exhibited a greater capacity to learn, adapt, experiment, innovate and develop. In the course of discovering a new creative power, humanity tends to lose sight of what it already knows and utilizes. We create marvellous new instruments for our advancement and then subordinate ourselves to those instruments, becoming increasingly dependent and enslaved. Thus, we have become victims of the machines we fashioned for our convenience, the laws framed to uphold our rights, the weapons we built for our defense, the markets we established to facilitate exchange, and the money we created for our collective prosperity. In the course of discovering the remarkable power of money as a form of capital, humanity has progressively lost sight of the other forms of dowry and patrimony on which the welfare and well-being of society is founded. The environmental movement that gained momentum after the publication of Limits to Growth, a report to the Club of Rome, sought to remind us of the obvious fact that the entire edifice of our modern economy is founded on the earth’s natural and biological D&P. Accumulation of monetary capital alone cannot ensure continuous growth, indeed it will have diminishing returns and give rise to increasing problems, unless economic growth can be carried on in a manner that preserves and enhances rather than destroys and depletes the natural capital. Limits to Growth did not condemn humanity to tread water perpetually at the present stage of its collective development. Rather it announced the limits of the old industrial model of growth, to the blind pursuit of growth for growth sake, and called for a significant change in the pattern and composition of economic activity. In fact, such a significant change in pattern was already beginning to emerge at the time of the report, but its significance was not sufficiently understood. Over the past four decades, the old industrial model of economic growth has progressively given rise to the knowledge-based service economy, with profound implications for the economic future of humanity, as we will discuss later in this article. One consequence of this development has been an increasing shift in emphasis from dependence on material D&P as the principal source of economic growth to an increasing emphasis on social and human capital, two other forms of cultural D&P capable of unlimited renewal and augmentation, which are now accumulating at an unprecedented rate. As indications of this shift, the number of students in secondary schools globally rose from 40 million to 531 million between 1950 and 2008, while the number enrolled in higher education globally rose from 29 million to 151 million between 1970 and 2008. Accumulation is a universal phenomenon. D&P represents the global stock of asset of various forms of ‘capital’. This stock undergoes a continuous process of inter-conversion. In some instances this process enhances some forms of capital while depleting others. But its main action is to multiply the value of all forms of D&P. Thus, the application of technology to agriculture has raised the productivity of the land five, ten and, in some instances, a hundred-fold. Sand, used for millennium as a constituent for making bricks, has subsequently become a source for making glass, silicon chips and fibre optic cables. Oil, which was once burned in lamps, is now converted into high value added synthetic materials and pharmaceuticals. Human beings, once valued primarily as a source of manual labor, have been increasingly replaced by machines and are now valued far more for their social, mental and creative capacities. 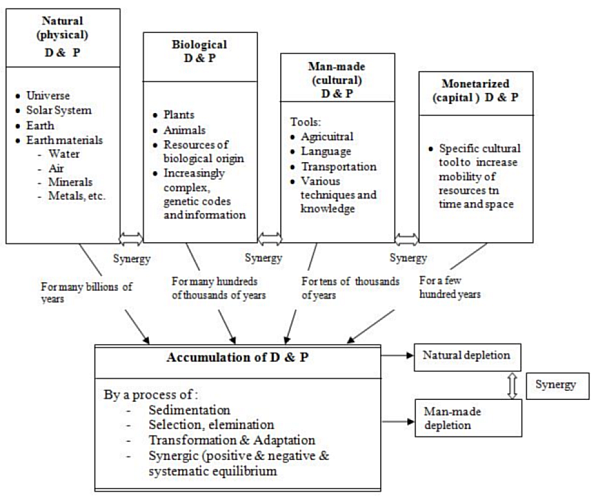 Figure 2 below depicts four main categories of capital or D&P. All forms of capital exist in a synergetic relationship as part of an evolving continuum. The interaction of these various forms exhibits an inherent capacity for self-replication or multiplication. The evolution of social organization (Cultural D&P) has given rise to an exponential growth of financial D&P. The spread of education has provided the foundation for rapid development of science, which in turn has given rise to a remarkable period of technological innovation that is still accelerating as predicted by Moore’s Law. One type of D&P often becomes the basis for creation or development of another type. But this is not always the case. In some instances a rapid increase in one form of D&P does not necessarily reflect an overall increase in the total stock of global assets. No matter how important the monetarized economy may be, it exists and functions solely on the foundation of physical, biological, social and human capital. Exhaustion of water or non-renewable energy resources, destruction of biodiversity, social unrest resulting from rising levels of inequality, the squandering and deterioration of precious human resources due to unemployment and underemployment may co-exist for a time with rising levels of global financial assets, which have multiplied from $12 trillion to over $212 trillion over the past three decades.7 The current international financial crisis shows just how fragile and evanescent the perception of wealth may be when limited to a single measure such as money. In recent times we have witnessed the sudden disappearance of trillions of dollars of what were once thought to be hard financial assets. A failure to appreciate and respect the interdependence between these different types of assets can have far-reaching consequences, as the global impact of the 2008 international financial crisis on economic growth and employment illustrates. Figure 2 also highlights another important attribute of economic value that is overlooked by contemporary theory. It can be either positive or negative. All that glows is not gold. All growth is not good growth. Economic activity resulting from war, environmental remediation, the rising costs associated with compensating for depletion of scarce resources reflect a deterioration in human welfare and well-being, not an enhancement, yet traditional measures of growth and national wealth regard them in the same vein as increased agricultural productivity, more housing, rising expenditure on education and healthcare. In order for economics to evolve into a true science of wealth and welfare, new concepts are required to define with comprehensive preciseness the notion of value we seek to enhance and new measures are needed that accurately reflect the real impact of social activity on that value. A wider conception of D&P illustrates the limitations of a narrow definition of capital. But the problem extends still further into unchartered regions of social activity and potential beyond the veil. It has always been recognized that a substantial part of productive activities in life and society are performed outside the monetarized context. Most classical economists from Adam Smith to John Stuart Mill devoted a considerable portion of their writings to a wider conception of productive labor and value that encompassed non-monetarized activities. Yet the very notion of value on which Smith founded his theory led in practice to the exclusion of the non-monetarized contributions to wealth creation in industrial societies. This was a logical result of his effort to focus on the means to enhance national wealth by harnessing the enormous potential of industrialization, specialization, trade and investment, rather than on efforts to measure national wealth comprehensively. He rightly perceived money as a powerful instrument of social engineering with the capacity to solve the complex logistical problems associated with industrialization. Since then economics has continued to ignore non-monetarized economic activities. Smith’s concept of value was derived from a measurement system based on market prices resulting from the interplay of supply and demand. Price, the monetarized value of goods, seemed to be a clear, easily quantifiable yardstick to measure economic performance. The reference price of a good defined by its monetarized value had considerable advantages compared to the vaguer statements and subjective indicators of performance commonly adopted by the social sciences. An objective price was the economist’s equivalent of the speed of light or the atomic weight of atoms in Physics. It elevated Economics above the other social disciplines and brought it closer to the quantifiable precision found in the natural sciences, where phenomena are more precisely defined and more readily lend themselves to objective measurement. Thus, during the Industrial Revolution, the convenience, practicality and reference to the scientific method of analysis combined to focus attention on monetarized activities as the key tool for developing the wealth of nations. While a focus on monetarized phenomena has proved helpful for understanding the production and utilization of manufactured goods, it is far less useful for obtaining a clear and comprehensive picture of how society evolves and how economics is being transformed in recent times by the emergence of the new service economy. Both unmonetized and non-monetarized wealth are inadequately accounted for in traditional economic theory. [‡] Today the predominance accorded to monetarized activities needs to be placed in a broader perspective. Several considerations compel us to insist on a wider conception of economic activity. First, the monetarized and non-monetarized fields are not separate air-tight compartments. There is a continuous movement across the invisible line separating priced from free goods and services. Thus, tasks which were formerly carried out without the use of money such as mom’s cooking and housekeeping have in recent decades been shifting to the monetarized economy as more and more women seek employment and families rely on fast food and daycare services to meet their family needs. This has a double-impact on monetarized growth, since it reflects both in rising family incomes as well as rising revenues for the daycare and fast food industries. At the same time, it does not properly account for the negative impact on life styles, leisure and health arising from the consumption of fat-rich restaurant foods, higher levels of family stress and less time for exercise. Similarly, the costs of retirement have escalated due to the continued fragmentation of families resulting in a separation of the generations. When processed store-bought and restaurant foods replace home-cooked preparations, quality and value may suffer, but GDP registers an increase in wealth-creation by the food industry as well as for businesses engaged in disposal of the discarded food packaging materials. No longer is grandma so readily available to care for the kids or sons and daughters to aid their aging parents. This has generated greater freedom and independence, but it has been bought at a price in terms of quality of life, which current economic measures do not accurately reflect. With the advent of the Industrial Revolution, money came into its own as the pre-eminent social institution. Until then, more than 50% of all economically productive activity was self-production for self-consumption or barter, i.e. it occurred without monetary exchange and remained non-monetarized. Even today money systems represent only a very limited portion of what truly characterizes the wealth of nations. Ecological resources are a good example of non-monetarized aspects of wealth. As ecologists have been emphasizing for decades, the monetarized system of measurement assigns values only according to the cost of extraction or processing. Thus, clear air and pure water may be assigned zero value; whereas when water has to be treated in order to remove impurities resulting from human activity or purchased in order to ensure health and hygiene, monetarized measures record the creation of positive new wealth. This view obscures the process by which free goods become scarce and once scarce goods become free. Is the world really “richer” today by $60 billion a year because so many people purchase bottled drinking water to avoid the risks of drinking water from the tap? The fact that resources which were once free or available at very low cost have become an increasing cost component within the industrial production system illustrates how the monetarized economic system may create new forms of scarcity in some areas in the very process of striving to reduce scarcity in others. At the same time, technological and organizational advances can transform once scarce products and services into free goods. Access to information and many forms of communication, which were once very costly, have become virtually free. Are we not richer today for the capacity to access the world’s knowledge at our fingertips and to communicate instantaneously across the globe, even though we pay little or nothing for the privilege? When we take full account of the complex interactions between the monetarized and non-monetarized worlds, we realize the inherent limits of the system of evaluation made prevalent by the Industrial Revolution and the underlying assumptions about wealth creation on which it is based. The increasing scarcity of ‘goods’ in the non-monetarized world may offset or even overcompensate for the decrease in scarcities in the monetarized one. The two worlds are interdependent. Clearly there is need for developing a theoretical framework as well as a system of accounting and monitoring capable of reflecting what is actually happening. There is another equally important reason for expanding our notion of value to include non-monetarized activities. As a rule new social potential first appears in the unstructured, non-monetarized sector and only gradually transitions over to the money economy. In this sense the non-monetarized sector is the birthplace and breeding ground for future progress. When Richard Sears started his mail order catalog in 1893 to cater to the needs of rural farmers who lived too far from urban centers for convenient access to goods, little did anyone realize that by 1920 the company he founded would become the largest retailer in the world, yet it still did not own or operate a single retail store. Rural America was prospering, but it lacked an appropriate delivery system to fulfill its rising aspirations. Sears’ catalog was a new form of social organization designed to monetarize this latent potential. With the advent of mass production after World War I, the automobile began to transform American life, resulting in a rapid migration of people from urban centers to new suburban communities, which were far removed from the convenience of urban shopping center. General Robert Wood, a logistics expert who helped build the Panama Canal, learned of this trend reading the US Statistical Abstracts. When he took charge at Sears in the early 1920s, he established the first of what became known as suburban shopping centers, which he subsequently opened in suburban areas across the USA. As a consequence, Sears’ department store business expanded right through the Great Depression, a time when overall retailing in America was down by 25%. Once again Sears converted a non-monetarized potential into monetary wealth. Social change gives rise to new needs and new opportunities which first appear in the unstructured region of non-monetarized potential. This uncharted region is not merely a finite residue left out of the national accounts. It is a creative frontier from which new opportunities are constantly emerging. Education is an example. It began millennia ago as an informal arrangement for the transference of knowledge from one person to another. In the 19th century, institutionalized public education became widely prevalent. More recently, all types and levels of education have been organized to convert them into commercial opportunities. As a consequence, the field of education has grown explosively to become a $2 trillion global industry. Whatever its shortcomings, fast food provides a valuable service that is increasingly in demand worldwide. In the USA alone the industry expanded from $6 billion to $110 billion between 1970 and 2000, currently providing employment to about 2.7 million people. Globally it is a $200 billion industry. Similarly, the daycare industry has expanded dramatically to meet the needs of working women. In the USA, daycare is now a $35 billion industry employing 1.5 million people and the fifth largest occupation for women in America. Overall the percentage of women working in OECD rose by 55% over the past half century. The explosive growth of microfinance globally in recent decades is an example of a social potential that remained unutilized because existing institutions were unable to find an appropriate strategy to monetarize it. As a rule, women are more reliable and responsible in managing money and repaying loans than men and they have entrepreneurial capabilities and productive talents which they are unable to express for want of effective institutional support. Since the founding of Grameen Bank thirty years ago, microfinance has grown into a global industry of more than $20 billion serving the needs of 150 million people, three-fourths of them women. Beyond the veil of money lies the unorganized, unstructured informal fringe of society that is continuously evolving new forms and throwing up new potentials, the ever-expanding source of social creativity that is the basis for future prosperity. Google was founded as a search engine company in 1998 without any evident model for generating revenue. Two years later it introduced Adwords, an innovative system for matching the interests of searchers with the offerings of advertisers. In a decade Google built Adwords into a $28 billion business. The manufacture of material goods may have its limits, but human imagination and social innovation do not. Furthermore, present measures of wealth fail to fully take into account the future value of investments in the non-monetarized sector. Can we really assess the value of investment in education in terms of the current cost of delivery? Such an accounting system may very well prompt us to invest in capital equipment and dispense with labor and education altogether. Measuring productivity as output per person rises when machines replace people, but what happens to the people? The carrying cost of idle plant capacity reflects badly on a company’s balance sheet, but which financial statement reflects the carrying cost of unemployed human beings and the deterioration in social stability and quality of life that result? Attempts to measure economic activity and wealth without reference to the impact on human beings can lead to surrealistic conclusions. It is dangerous. The one and only acceptable objective of economic activity is to promote welfare and well-being of all humanity. Current systems of national accounts do not even include a balance sheet of assets and liabilities, let alone one that reflects the impact on non-monetary resources. Education is investment in the most precious of all our resources, human beings. Businesses regard capital spending on future production capacity to enhance future profits as investment rather than expenditure. Similarly, present spending on education should be accounted for as an investment in human capital to promote future wealth and welfare, as proposed by Jacobs and Šlaus in an earlier issue of Cadmus.8 Only a human-centric economic theory and system of measurement can effectively serve these objectives. The process by which the creative potential of the non-monetarized dimensions of society is converted into wealth is yet to be fully understood. We might say that the entire monetarized economy represents an effort to structure and organize various aspects of humanity’s social existence so that they can be performed more cheaply and easily for the benefit of the collective. But this act of organization does not diminish the size or potential of the non-monetarized sector; rather it enhances it, because it progressively liberates human beings from the total preoccupation and drudgery of physical labor and material activities, so they can concentrate more of their time and energy on developing and expressing higher faculties. Freedom from drudgery provides the leisure time for thinking, exploring, discovering, interacting, inventing, innovating and creating. In the process, human beings become less physical, more social and mental; less repetitive, more creative. As the external society becomes more organized, the inner character of human beings becomes more developed and capable of expression in outer life. During the heydays of the industrial age, the deficiencies in traditional measures of economic flow may not have undermined their essential utility. But today they raise fundamental questions which need to be addressed by new theory to evolve a more valid conception of wealth-generation and human welfare. Which blend of monetarized and non-monetized activities contributes most positively to wealth-generation and human welfare? How can we more consciously tap and organize the unstructured, non-monetarized social potential to promote greater human security, welfare and well-being? In Descartes’ time he was suspected by theologians of launching a counter-religion to replace the universal truth based on God and administered by the Church. Descartes defended the scientific method of induction by asserting that it focused only on those realities which are clearly verifiable and distinct, but the theologians perceived that the ideological and metaphysical implications of his approach could be much greater. Indeed, the words science and scientific have come to connote that which is certain beyond doubt. Cartesianism signaled a tremendous change in cultural perspective, which was at the root of the Industrial Revolution. But it has not led to the world of certainty that 19th century scientists once anticipated and humanity still aspires for. Rather, we now realize that the further we pursue the quest for scientific knowledge, the more we discover our own ignorance and the more uncertain we become about many things we once comfortably took for granted. As Pascal said, “Science is like a ball in the universe of ignorance. The more we expand knowledge, the greater the ignorance encountered by the ball’s expanding surface.” 9 Today we measure the advance of science much more by the growing number of questions it seeks to answer than by the veracity of the answers it arrives at. Science has discovered the relativity of all our perceptions and measures of reality in space and time. It is compelled to acknowledge fundamental limits to mind’s capacity for knowledge which are inherent in nature. We may never be able to really ‘know’, but we can always ‘know’ more than before. A positivistic conviction in our progress toward certainty was an explicit premise of the Industrial Revolution. The objective was to uncover and assemble the discrete pieces of valid knowledge needed to complete the picture of universal truth. Experience has exposed the fallacy in this view. For each attempt to frame a problem involves defining specific assumptions which may be at variance with or contradictory to previously accepted truth. Assuming that the earth was flat proved satisfactory for land-based navigation across continents, but invalid when trying to navigate the open seas. Each new discovery unfolds new layers of reality previously unknown and reveals increasingly complex relationships between the layers. Mendel’s concept of a gene proved adequate for cross-breeding of plants, but not for understanding the reproduction of chromosomes or the molecular synthesis and recombination of DNA. The microscopic behavior of molecules and atoms has proven inadequate to comprehend the behavior of subatomic particles or to reconcile them with astronomical phenomenon. When it comes to the social sciences, the quest for certainty has proven even more elusive. While the division of knowledge into discrete subjects has enabled physical science to study material nature one layer at a time and uncover the relationships between the layers, social life represents an inextricable mixture of factors – political, social, economic, cultural, historical, geographical, demographic, psychological – which refuse to remain segregated or respect the boundaries assigned to them by the scientist. Thus, money is at once an economic, social, political, cultural and psychological power. Its value, power and behavior are the complex resultant of the interaction of all these factors. In spite of its limitations, physical science admits of a degree of certainty which the social sciences are unable to attain. Although we cannot arrive with certainty at the precise position and velocity of an electron, we can be quite sure about its mass and charge; whereas in economics, the very notion of value is deeply problematic. The value of the most material of objects – a piece of land at Rockefeller Center in New York City, a home in Beverly Hills, an ounce of gold or a currency note – may be subject to such rapid, drastic and unpredictable fluctuations that it sometimes defies imagination, let alone prediction. The price of gold has doubled in the last two years. Between 2002 and 2008, the price of oil rose four-fold. Mass production may be able to predict with great certainty the speed with which a product can be produced, but value added measures cannot accurately predict market value or the interval before a product becomes obsolete. If we are unable to arrive at an objective value for a physical object, how much greater is the challenge to assign absolute value to wealth, welfare and progress – terms which vary widely over space and time? The utility of a fur coat or an air conditioner depends very much on the climate you live in. The value of a rare painting or priceless designer dress depends very much on who you are. Perhaps the difficulty is that we are attempting to define an inherently subjective condition in purely objective terms. Uncertainty is a fact of life. Yet, as it presents itself to us it appears to have two apparently opposite and contradictory characteristics. On the one side, it appears to be the source of the anxiety and insecurity from which humanity progressively seeks to escape. On the other, it appears to be the source of unimagined opportunity and creative potential. Uncertainty provides the raw material for humanity’s searching, aspiring, seeking, imagining, creating, discovering, developing, inventing and innovating, the very acts which set us apart and above other species. Uncertainty is a creative cauldron out of which every new discovery and accomplishment emerges. Our efforts to limit and circumscribe uncertainty, as if it were a finite realm, are the source of humanity’s greatest achievements, as agriculture was invented to overcome the uncertainty of nature’s bounty. Diplomacy in the conference room is an effort to eliminate the destructive uncertainty of war. Law and social custom were invented to provide common rules for interactions between people. Democracy is a system intended for orderly decision-making among people with diverse interests, perspectives and values. The market is a social organization designed to efficiently match buyers and sellers in the otherwise teeming, chaotic uncertainty of commercial life. The challenge is not to abolish uncertainty, for only death is for sure. The challenge is to find ways to creatively harness the potential of uncertainty and harvest greater security, wealth and well-being from its grasp. Historically, uncertainty has always been an undeniable fact of life – as it was during the long agrarian epoch and since the beginning of the Industry Revolution, but it assumes an even more central character and significance in the modern service economy that is emerging, which we explore in the next section. The emergence of the modern service economy is a natural consequence of the evolution of manufacturing during the 19th century. As the production technology of the Industrial Revolution increased in complexity, the knowledge, expertise and auxiliary services required for design, development, research, manufacturing, testing, maintenance, after sales service and waste disposal increased disproportionately. Advances in the application of scientific knowledge drove this process of increasing sophistication and complexity. Research and development strove to identify and develop ever newer, cheaper and better quality materials, machines, production processes and products. Thus, over the past century industrial and commercial research functions have grown to involve tens of millions of workers. While the greatest challenge of the 19th century was increasing supply through higher, more efficient production, the greatest challenge of the 20th century became developing the markets capable of absorbing the increased production volumes and ensuring satisfied customers who would return to buy again. Advertising, distribution management and after sales service became crucial. While unskilled workers could quickly learn how to perform most functions on the early assembly lines, over time the levels of worker education and skill increased enormously. This required a change in the composition in the workforce of industrial enterprises, a progressive shift from manual labor to trained technicians, engineers specialized in a wide range of subjects, systems developers and analysts, planners, financial, sales and marketing experts. A more educated, higher paid workforce also necessitated greater knowledge and specialized expertise in organizing, managing, motivating, training and developing people. As firms grew from privately-owned and managed local businesses into regional, national and multinational, publically-owned corporations, the financial expertise needed for raising capital, managing costs, pricing products, negotiating supply and marketing contracts, taxation, dealing with banks and financial markets multiplied. Topping off these diverse functions was the increasing need for general organizational expertise to manage, coordinate and integrate activities for procurement and production planning, inventory management, strategic planning, new business development, legal services, community, government and investor relations. While Henry Ford is credited with first applying the principles of mass production to automotive manufacture, it was Alfred Sloan at General Motors who introduced the decentralized, multidivisional organizational structure that enabled GM to lead the global automotive industry for eight decades. The same requirement for a diverse range of specialized services arises at each level of manufacturing from raw material extraction and processing through the multiple stages of component production, subassembly and final assembly, whether carried out within a single firm or by hundreds of different firms in the supply chain. Thus, throughout the 20th century, the functions associated with production technology (R&D, product design, quality control and manufacturing engineering), organization, human resource management, sales and marketing, and financial management became increasingly important determinates of business success and economic growth. Few of these functions were directly involved in actual manufacturing, yet all of them became essential services without which basic manufacturing could not be undertaken or sustained. In other words, as it became more sophisticated, industrial enterprises progressively transformed themselves into service organizations, which also performed manufacturing functions. Thus, we find today that the vast majority of employees in traditional manufacturing firms are engaged in performing service functions. What occurred within industrial enterprises also occurred in the economy-at-large. A huge infrastructure of service-related social organizations emerged, specialized in countless subfields of expertise to support expanding industry – government administration, education and training, scientific research, employment, financial, marketing, legal, transportation, logistics management, communication, waste disposal, recycling, banking, insurance and financial services – until these rapidly growing service functions became the dominant driving force for the expansion of the entire economy. The development of the Service Economy is best conceived of as a global process involving the whole economy, in which service functions are integrated into all productive activities, rather than simply the growth of a tertiary sector beyond agriculture and manufacturing. Simultaneously, the higher productivity, wealth generation and living standards resulting from the evolution of manufacturing stimulated the growth of another range of services designed to meet the growing needs and aspirations of a more prosperous population. The economy developed a second powerful engine, the engine of growing consumer demand. To meet the demands generated by higher levels of prosperity, services related to retailing, travel and tourism, communication, information, education, healthcare, banking, investment, and insurance, legal and other professional services, food and hotel services, media, entertainment, and recreation also expanded exponentially. Our very conception of what constitutes a basic need changes as society advances. Engel’s law states that services are secondary in most cases because they fulfill only non-essential needs. Before and during the Industrial Revolution, only food, shelter and clothing were considered primary. Today that is no longer the case. Education, healthcare, financial services, computers, internet, and entertainment have become an integral part of modern life, without which it is difficult to survive socially and succeed economically. Services represent the vanguard of emerging social needs and have become essential means for promoting the wealth of nations. The combination and convergence of these interdependent movements have given rise to the modern Service Economy which we know today. Services now account for 64% of global output and more than 70% of employment in OECD countries.10 These figures underestimate the contribution of services, since in many cases they fail to take into account service functions and employment within manufacturing industries. The cost of growing tomatoes represents only two or three percent of the sale price of a bottle of tomato sauce. The cost of producing and assembling an individual automobile represents only about 20 to 25% of its total cost. This shift to a service economy necessitates a fundamental change in the way value is measured. At first glance it may not be apparent how or why the proliferation of service functions should alter in any fundamental way the inherent nature of economic value. But a closer examination reveals that it has profound implications for economic theory and economic measurement. The economic theory and measures of value posited by classical and neo-classical economists were based on the premise that manufacturing is the dominant source of wealth creation. The Industrial Revolution made plentiful many products that were previously either very scarce or very costly. Between the 1780s and 1860s, mechanization reduced the cost of cotton cloth to just 1% of its earlier level. Therefore it was assumed that any augmentation of production constituted a net increase in wealth. Measuring increases in the monetary value of output, i.e. the flow of production, was regarded as an adequate measure of increasing wealth, i.e. the total stock of economic value. This assumption proved overly simplistic. It failed to take into account the depletion of physical and biological assets (D&P) that occurs during the production process. Overlooking the complex relationship between physical, biological, social, human and financial forms of D&P, it concluded that an increase in the accumulation of financial capital is synonymous with an increase in overall wealth. Some forms of economic activity, such as bottling drinking water, waste disposal and environmental clean-up represent efforts to compensate for the negative aspects of economic activity, rather than net additions to wealth. In addition, it ignored the concept of negative value or value deducted, the fact that some economic activities such as war or extracting non-renewable resource, may destroy or consume rather than generate wealth. The growth of the modern service economy adds to these deficiencies another and more fundamental problem of measuring wealth – the problem of time. The problem arises from the difficulty in precisely assigning economic value to either a manufacturing or a service activity at the point of sale and delivery. The Industrial Revolution gave rise to measures of the increase in the economic value of the flow of production through various stages of manufacture, assuming that the production process was complete the moment a product or tool was available for sale on the market and that all costs associated with its manufacture contributed positively to wealth-creation. This assumption seemed logical and consistent at the time. Firms purchase raw materials at a given price, process them into manufactured goods, package and deliver them to customers. At that point the transaction is complete and all the costs can be known. Thus, calculating the gross national product at factor cost became a standard measure for production and wealth-generation in a monetarized, manufacturing-based economy. Today this concept is no longer adequate. Even in manufacturing, the true cost of a product often depends on its effective performance (value) during a prolonged period of utilization. After-sales service, waste disposal and product liability have become major cost factors even for manufacturing companies, factors which cannot be accurately known at the time of production or sale. This fact was dramatically illustrated by Toyota’s worldwide recall of more than nine million vehicles in 2009-10 – equal in quantity to 90% of total light vehicle sales in the USA in 2009 – which cost the company and its dealers upwards of $4 billion, a cost which was not known and could not be reliably estimated at the time of sale. Tracing the process back in time to the beginning of the design and production cycle, today the costs incurred in the development of manufactured products commence long before a new product ever reaches the production line, even in instances when the product is never actually produced. The costs associated with research and development, testing and prototyping can be many times greater than the direct cost of manufacturing the product. Pharmaceutical companies, for example, spend billions of dollars annually on medical research to develop new products. The average development time for a successful drug is about 12.5 years. The actual cost of materials and processing to manufacture patented prescription drugs typically represents only five percent of their final sale price. The high cost of that research also results from the fact that the cost of a great many failed research projects has to be amortized against the few successful products that emerge from R&D and come to market. Less than one in a hundred new ideas reaches clinical trials and fewer than 10 percent of these are approved for sale. Of every 250 drugs that enter preclinical testing, only one is approved by the US FDA. Thus, a true measure of value would have to take into account the entire range of costs incurred during the entire lifetime of a product prior to, during and after production. The evolution of the Service Economy necessitates a change in the fundamental notion of value. When it comes to services, taking into account the costs incurred during the full period of utilization is still not sufficient to arrive at an accurate notion of economic value. Cost, even comprehensive and inclusive cost, is an insufficient index of real contribution to wealth. We need, instead, a wider concept that also takes into account utilization value. Utilization value refers to the use value of the assets created (stock), rather than the notion of added value (flow). The value added measurement of mining for scarce natural resources considers only the monetarized costs of the activity (flow), but does not fully reflect the reduction in the overall stock of physical D&P associated with the consumption of an irreplaceable resource. The cost of a product does not tell us how long or how well it will serve the intended purpose. The US construction boom that resulted from easy bank credit in the middle of the last decade leading up to the subprime mortgage crisis resulted in a massive increase in the number of residential and commercial buildings, many of which have never been occupied since their construction. People were employed, materials were consumed, but has national wealth really been augmented by this activity, if the buildings themselves are never utilized? What is the true value of a computer or mobile phone or a technical education that is soon outdated and obsolete? Common sense tells us that our real wealth and welfare depends on the use value we derive from the products and services we acquire and that this use value in turn depends on the period over which they can be utilized. This is true of products as well as services. But as we shall see, in the case of services, utilization value assumes paramount importance. Economic activity in the modern Service Economy is closely related to the performance of integrated systems. This is true even for manufacturing activities. Products are conceived, designed, engineered, produced, sold, serviced and disposed of by means of systems which are integrated with countless other systems within and outside the manufacturing firm – systems for research, testing, training, monitoring, communicating, transporting, warehousing, servicing, etc. The product no longer exists as a stand-alone discrete unit. It exists as part of a system, like a computer periodically in need of service. This has been true since the introduction of mass production, but it is far more important today. While the cost or value of a discrete product can be estimated at the point of sale, the cost or productivity of the system can only be measured in terms of its performance relative to the entire cycle from conception through production and delivery to final disposal. While the industrial economy attributes value to products which exist materially and are exchanged, value in the Service Economy is highly dependent on the functioning of result-producing systems, such as systems for delivery of education and medical care. The reference for value is not to the “product” but to the utilization and usefulness of the system. Increasing productivity in the Industrial Economy is measured by the cost of the inputs used for producing products or tools; whereas attempting to measure productivity in the Service Economy by the cost of inputs without reference to specific performance is very close to nonsense. The productivity of a healthcare system depends on its capacity to cure illnesses or maintain a healthy population. The salaries of teachers or investment in school buildings cannot suffice as a proper measure of educational productivity. Assessing the productivity of an educational system needs to be based on an evaluation of the quality of learning by those who pass through it. Thus, while Industrial Economy evaluates the production of wealth in terms of added exchange value, wealth in the Service Economy is a function of utilization value. This is evident with regard to services such as telecommunications, education, healthcare and financial services. In each of these industries, services are typically delivered over long periods and only a small portion of the cost is associated with the actual delivery of a specific service at a specific moment. The marginal cost of a single phone call is virtually zero, provided that the service depends on the existence of a massive infrastructure of telecommunications equipment, on which the investment and maintenance are nearly independent of the amount of usage. So too, the delivery of educational, medical and financial services depends on a huge infrastructure of schools, hospitals, banks, instructors, physicians, financial experts and administrative personnel. Each of these services forms part of an integrated system, linked with other social systems. In all these instances, the major cost is the cost of establishing and maintaining the system, regardless of the extent to which it is utilized. But its value, its real contribution to wealth and welfare, depends entirely on the extent of its utilization and the usefulness or quality of the service delivered. Furthermore, in the purchase of services the buyer is primarily concerned with performance over a period of time. This is where risk and uncertainty become crucially important factors. Because a system must operate reliably over time, full evaluation of a system cannot be carried out before or at the specific time of service delivery. It can only be assessed by how the system functions in real time in the dynamics of real life. Whenever real time is taken into consideration, the degree of uncertainty and the probability become central issues. Will our mobile or internet service provider deliver reliable high speed bandwidth all hours of the day and days of the week? Can we obtain emergency services from our healthcare provider anytime and place as we may require? Does the manufacturer of our computers provide on-site service within 24 hours? Cost in manufacturing is typically measured at the stage up to the point of final sale, whereas in regard to services the actual cost of full delivery may not be known until long after the sale. Because of the extended period of utilization time, the true cost over an extended period of utilization is in most cases not a fixed quantity, but a probability that depends on future events. The utilization value is probabilistic, rather than deterministic. It involves new types of risk and far greater degrees of complexity, vulnerability and uncertainty. The probabilistic nature of economic value is dramatically illustrated by the recent subprime mortgage crisis in the USA. Between July 2007 and June 2008, rating agencies lowered the credit ratings on subprime mortgage securities by $1.9 trillion. Bad policy and business decisions based on valuation errors occurred on an inconceivable scale. Residential properties in the US declined in value by more than $5 trillion or 32% in a single year. The value of retirement assets and other investment assets dropped by more than $8 trillion. Huge as it is, these losses pale into insignificance when compared with the potential risks of climate change. Both the costs and inherent uncertainty associated with the future impact of carbon-generating industrial activities may be of an order of magnitude higher. Any system operating to generate some future result operates under conditions of risk and uncertainty. To understand the inherent uncertainty associated with contemporary economic activity, a distinction needs to be made between two essentially different kinds of risk – entrepreneurial and systemic. Entrepreneurial risk is a characteristic of all commercial activity arising from the decisions and actions of those involved. But a major portion of the risks associated with the operation of the Service Economy and human security in contemporary society are systemic in nature. Systemic or pure risks arise primarily from vulnerabilities in the social and physical environment, rather than from the actions of the affected individuals. Hurricanes, tsunamis, bankrupt governments, recession, drought, political paralysis in Congress, and war are instances of macro level systemic risks. But the same type of risk exists at lower levels as well. The highly systemic nature of modern economic systems and the increasing technological complexity of its components necessitate an ever deeper economic understanding and control of the vulnerabilities of these systems. The terms risks and vulnerabilities can generate a fatalistic feeling of anxiety, helplessness and paralysis. But they represent only one side of uncertainty. On the other lies the unstructured potential from which social creativity continuously throws up new opportunities. Far-sighted entrepreneurs, such as Steve Jobs, learn to perceive the opportunities as well as the challenges arising from very rapid technological change and other sources of uncertainty that emerge from this uncharted realm – opportunities for defining new directions, for inventing and stimulating new products and types of activity in the quest for real economic growth and social progress. The urgent quest for greater security and certainty are prominent characteristics of our age. This is partly due to the fact that people are living longer and must make provision for their maintenance during a prolonged period of retirement. It is also partly due to the fact that our expectations of security have risen dramatically in recent decades with the evolution of the modern welfare state, social security, medical insurance, unemployment insurance and other forms of protection. Since the end of World War II, a silent revolution in social welfare has spread throughout the world. Peter Drucker referred to it as the “unseen revolution” and “the American way to socialism”. Today social security expenditure in Western European countries accounts for more than 20% of GDP.12 Education alone accounts for 5.5% of GDP in the USA. This trend represents a change in social values and an attempt to manage the vulnerability of individuals to systemic risks. Insurance is an obvious example of the probabilistic nature of cost and economic value. Hurricane Katrina is estimated to have cost upwards of $200 billion, including $120 billion in insured catastrophic losses. In addition, we should add the significant increase in the cost of home insurance that affected all US homeowners in the years following the disaster. The true cost of the recent tsunami and the nuclear accident at Fukushima may not be known for many years. Human error can be as costly as the most violent acts of nature, as in the case of Kweku Adoboli, a trader in UBS’s risk management division, whose actions recently cost the bank $2 billion. As for the society, so for its individual members. The quest for certainty and security are fundamental human aspirations and essential components of wealth and welfare. Yet in spite of enormous social progress during the past two centuries, both uncertainty and insecurity are ever present threats. Soaring levels of unemployment, skyrocketing healthcare costs, longer retirement periods due to increasing longevity, collapsing home prices and wildly fluctuating stock and bond prices are just a few of the many ways in which uncertainty and insecurity continue to impact on individuals and families. They combine to make insurance a primary need for human security and for welfare in contemporary society. Insurance is a novel social organization devised to promote far higher levels of security and certainty for individuals by spreading the risks over a large population. It is perhaps the clearest example of the economic potential for transforming uncertainty into economic value. In spite of the high growth rates of the insurance industry globally in recent decades, the untapped potential for increasing existing types of insurance is far from saturated. An even greater potential contribution to wealth, welfare and human security can be achieved by extending the principles of insurance into fields where it has not yet penetrated. Creative methods of adopting insurance to education can dramatically accelerate the rise in general levels of education. Innovative insurance programs can encourage talented employees to become entrepreneurs, thereby creating jobs for others. A fundamental flaw in the prevailing measures of economic growth and national wealth is the implicit assumption that all monetarized economic activity adds to the total stock of national wealth and that this is the sole or primary determinant of the wealth of nations. Since the time of Adam Smith, the value added to national wealth is taken to be equivalent to the sale price of all products, which normally includes the cost of manufacturing and marketing them plus a margin of profit. Thus value added forms the basis not only for measuring the volume or flow of all economic activity as commonly measured by the gross domestic product, but it is also taken as equivalent to the net addition to national wealth. The implicit assumption is that all monetarized activity represents growth and all growth represents additional wealth. Classical economists, in particular Ricardo, were well aware that the methods employed to account for economic wealth were not comprehensive of the real level of wealth of an individual or a country. Ricardo made a distinction between riches and wealth, one a measure of a person’s capacity to command necessities and enjoyments he seeks and the other, a measure of the value added cost of what is produced. Riches may increase as a result of an improvement in technology that lowers the cost of production, a circumstance in which wealth may decline due to the lower selling price of the product. These distinctions were considered secondary because the main problem during the Industrial Revolution was to identify the most dynamic system for increasing the wealth of nations via the industrialization process. Later economists were strongly influenced by this first formulation of economic theory. Thus, the value added flow of goods became the principal means of assessing wealth. In the Service Economy, where the industrialization process per se is no longer the prime mover for increasing the wealth of nations, the problem is quite different and the contradiction between wealth and riches much more important. The divergence of the notion of riches from the notion of wealth is associated with what may be called deducted values. Deducted values are associated with the consumption of economic resources by activities that do not add to the real level of wealth or riches, but which add to the costs of the economic system. The rising cost of mining for oil or minerals from deeper in the earth adds to the value added calculation of production, but adds nothing to the real wealth and welfare of society. Rather the excessive exploitation of these resources diminishes real wealth by reducing the stock of resources available for future consumption. Such a system of accounting is equivalent to operating a business without a balance sheet showing its assets and liabilities. A clear picture regarding the performance of a business requires an analysis of the flow of activity reflected in the profit and loss statement, as well as an analysis of changes in its total assets and liabilities. A well-endowed company might conceivably continue operating at a net loss for years on end without visible indications to the outer world, by depleting the entire stock of capital invested or accumulated in the past or by borrowing more and more money it will be unable to repay in future. It is only when we take into account the net stock of assets that we can determine the real level of wealth generation over longer periods of time. Furthermore the classsical notion of value neglects the contribution of non-monetarized activities to wealth and welfare, which may be equal or even greater in value than the monetarized flow. One need only imagine for a moment the impact of stopping all voluntary, personal assistance and health care services provided by family members, as well as all the unpaid work one presently does for one’s own maintenance, to realize how essential these activities are to our overall welfare and well-being. Figure 3 depicts the problem of measuring national wealth solely in terms of monetarized value added. The bathtub W represents the real wealth of the nation. 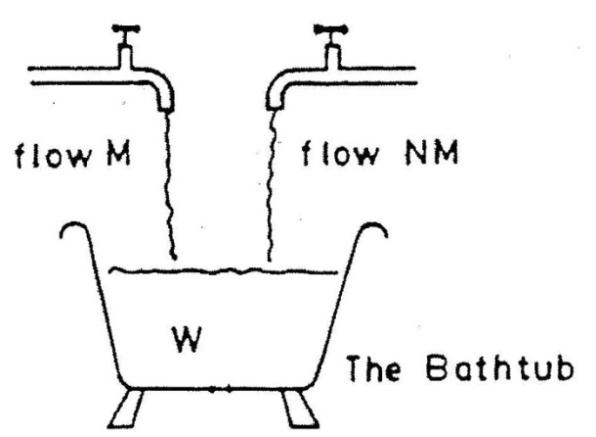 The first water tap M represents the flow of monetarized wealth which is assumed to be a net addition to wealth, even when that flow involves remediation for pollution, the rising costs of increasingly scarce fossil fuels or emergency expenditures to recover from a hurricane, tsunami, nuclear accident or war. No distinction is made in this model between positive and negative value, between value added and value deducted. Note that the loss of wealth due to these catastrophes has never been deducted from the tub, but the amount spent trying to compensate for them is regarded as a net addition to wealth. The second water tap NM represents the flow of non-monetarized, unpaid human activities, which make a fundamental contribution to real wealth and welfare, but are completely ignored by the current system of national accounts. Thus, if every citizen were to insist on paying someone else to perform even the most basic functions relating to their household and personal affairs, M would rise enormously, giving the impression that wealth has also increased enormously, whereas we would only be spending our accumulated savings or foregoing our leisure to work extra hours to pay others to do what we were formerly doing ourselves. Note that this system is also inadequate to measure net additions to wealth arising from technological advances. The average price of a personal computer today in constant dollars may be less than 20 percent of the price in the 1980s, but the speed, storage capacity and functional capabilities of the product itself are thousands of times greater. Similarly, the real cost of international telephone calls may average only one percent of the cost forty years ago, while the real cost of international air travel may have declined by 50 to 75 percent. Thus, while in some ways we have grown poorer in recent decades because we must pay for goods and services that were formerly free, in other ways our real wealth has increased far faster than incomes have risen and even in cases where real purchasing power appears to have remained constant. Another limitation arises from the fact that many riches are conditioned by our location. Countries with cold climates will always need to develop more sophisticated heating systems than those situated in temperate and tropical zones. In colder climates, more monetarized activities are needed in order to provide artificial, man-made sources of heat that can be stockpiled for winter; whereas in warmer climates, more monetarized activity may be required to provide for artificial cooling. Value added costs in either case may be higher than in the temperate regions in between. Which type of country is richer and which poorer, those that have to spend a lot of money on heating and cooling or those which have no expenditure at all on climate control? The limitations of the accounting system we have inherited from the Industrial Revolution are nicely depicted by the paradox of heaven and hell applied to the notion of scarcity. In heaven, nothing is scarce because everything is free. Since everyone is satisfied with what they receive, there is no need for economic activity, prices or transactions, which means there is no value added, no GDP and consequently no measure of wealth. In hell, everything is scarce and highly valued and lots of energy is consumed to manage human resources, which means that the value added and GDP derived from obtaining the most basic of necessities for survival are very high, as is the case during war-time rationing. Thus the paradox that less scarcity leads quite naturally to less economic monetarized wealth. The more we acquire all the necessities and enjoyments we seek, the less adequate the current notion of value is for reflecting our progress. The current system no doubt offers considerable advantages for measuring short term changes in economic activity. The problem arises because economic growth as measured by net value added and GDP is commonly mistaken for a net addition to national wealth and economic welfare. Numerous alternative systems that attempt to measure the real stock of wealth have been proposed, but such measures can only be approximate and will be partly subjective, akin to the estimated goodwill in a company balance sheet. The choice in future may well be between a system of flow measurement which is quantitatively precise but increasingly devoid of significance, and systems of asset measurement which might be less precise but will be more relevant to the real world. The quantification of non-monetarized wealth components can be achieved through adoption of a multiplicity of indicators. Even problems related to differences in location, climate and life style can be resolved. After all, there are already economic indicators such as the consumer price indices, which are not identical for all countries, designed to take into account differences of this type. This is a crucial topic, as any method of asset accounting would also make possible a better definition of riches and poverty. Such measurements can include indicators that have been developed in many sectors and for many purposes over the past half century. Yet without the context created by new economic theory, there can be no consensus as to the definition of these indicators, nor can they be given the significance and status they require to become efficient instruments to promote human security and the real wealth of nations. The transition to an economic system and theory which go beyond the traditional notion of economic (added) value requires acceptance of a degree of uncertainty with regard to our measures of wealth and progress. This uncertainty stems from the fact that the very question of what wealth should be entails defining certain goals and expectations. Our conception of wealth will always be a relative construct, a function of time and evolution of society. For this reason, new measures may never arrive at a reliable notion of wealth, but even if we cannot define it, we will know it when we see it. It will be a world in which the capacities of every human being have an opportunity for development and gainful employment; a world in which everyone has the necessities of life – not only the necessities for mere physical survival, but also the modern necessities for human security and development; a world in which we do not pillage the earth and rob future generations for present enjoyment. Having come this far over the last ten millennia, the last two centuries and, especially, the last five decades, surely there must be a way to get there. Having learned how to progress so rapidly, surely it need not take a long time to arrive. But we need a new roadmap, for present economic theory and measurement do not and cannot tell us how to get there. With all its limitations, is it not wiser to accept the notion of value and a simple system for measuring it which has served us fairly well in the past? Alas, it is a matter of evolution. Hunting and gathering served humanity fairly well at one time, as did traditional forms of agriculture, monarchies, city-states, handwritten books, handmade shoes, the horse and carriage, telegraph, LP records, silent motion pictures, typewriters, VCRs, landline telephones and countless other remarkable inventions and social innovations. But had we been satisfied with any of them, we could not today enjoy a fraction of the comforts, conveniences and security that modern life affords. Had we not learned how to raise agricultural productivity, Malthus’ prediction would have certainly come true. The problems humanity confronts today suggest that it is time to move on, to move forward. The severe strain being placed on the natural environment is one indication that old concepts and old measures no longer suffice. Rising levels of unemployment, ever increasing levels of inequality, social tension and unrest are point to the same conclusion. We see the effects all around us, but our science and our numbers assure us everything is perfectly alright. Moreover, the process of social evolution we have been tracing has not reached an end or conclusion; it is only our outdated conceptions, attitudes and values that have exhausted their utility. We have organized production to perfection, but left out the most crucial ingredient – humanity. We have raised the value of GDP phenomenally, but overlooked the value of human security. The process of society’s past evolution offers hope and assurance that there is a better way and a better life for all humanity waiting to emerge. Human-centered economic theory and measures of wealth, welfare and human security can help us realize it now. Robert Heilbronner, Les Grands Economistes (Paris: Seuil, 1971). Roy Campbell and Andrew Skinner, Adam Smith (London: Routledge, 1982). David Landes, The Unbound Prometheus (Cambridge: Cambridge University Press, 1972). This is one of the best books on the history of the Industrial Revolution. Ivo Šlaus and Garry Jacobs, “Human Capital and Sustainability,” Sustainability 1, no.3 (2011):97-154. Adapted from Orio Giarini, Dialogue on Wealth and Welfare: A Report to the Club of Rome (Oxford: Pergamon, 1980), 169. Garry Jacobs and Ivo Slaus, “Indicators of Economic Progress,” Cadmus 1, no. 1(2010): 53-113. Orio Giarini and Walter R. Stahel, The Limits to Certainty (Dordrecht: Kluwer Academic Publishers, 1993), 20. Orio Giarini et al., “Introductory Paper for a Programme on the wealth of nations revisited,” Cadmus 1, no. 1 (2010): 9-27. Pei-Fen Chen et al., “Insurance market activity and economic growth: An international cross-country analysis” Annual Conference of economists September 2010. Marco Arena, “Does insurance market activity promote economic growth?,” Journal of Risk and Insurance 75, no. 4 (2008):921-946. “Assessment on how strengthening the insurance industry in developing countries contributes to economic growth” USAID, 2006. Krishna Chaitanya Vadlamannati, “Do Insurance Sector Growth and Reforms Affect Economic Development? Empirical Evidence from India,” The Journal of Applied Economic Research 2, no. 1 (2008): 43-86. Liyan Han et al., “Insurance Development and Economic Growth,” The Geneva Papers 35, no. 2 (2010):183-199. Giarini and Stahel, The Limits to Certainty, 9. [*] The word Dowry is used in conjunctìon with the word Patrimony to ensure that the notion of "global assets" is sufficiently wide to encompass both feminine and masculine components. [†] Evaluation made by Ivan Illich in a paper on Shadow Work, presented at a conference at the University of Kassel, September 1980. [‡] Monetized refers to systems in which money is used for exchange. Unmonetized refers to systems in which exchange takes place without the use of money, as in barter exchange. Non-monetarized refers to systems in which no economic exchange occurs (self-production, unpaid housework) or no economic value can be assigned (air, health, family, creativity, leisure, culture, stress, peace, security, well-being). [§] Most of the discussion on uncertainty as well as many other important concepts presented in this article are based on original work presented in Orio Giarini and Walter R. Stahel’s The Limits to Certainty (Dordrecht: Kluwer Academic Publishers, 1993).